Everyone wants to have straight, perfectly aligned teeth; but no one wants to have a “metal mouth.” That’s always been the downside of orthodontics — the metal bands, the wires poking your lips and cheeks, the difficulty eating and cleaning your teeth. Dr. Sorensen now offers a visibly better alternative to traditional braces for teens and adults, Invisalign®. Rather than bands and wires, Invisalign® uses a series of clear plastic “aligners” to move teeth into their correct positions. Contact Dr. Sorenson today to learn more! Invisalign® is an alternative orthodontic system. Instead of using bands cemented to the teeth with wires strung through them, Invisalign® uses clear aligners that the user wears for 20-22 hours per day, but can removed for eating and cleaning his or her teeth. Traditional braces create movement by adjusting the pull of the wires and using various rubber bands. This leads to a fair degree of soreness every month for a few days after the wires are tightened. Invisalign® instead uses aligner trays that the patient wears for two weeks. Each series of upper and lower aligners gently move the teeth closer and closer to the end position. After wearing a set of aligners for two weeks, the pair is discarded and replaced by the next pair. This process continues until the teeth are aligned and in position. The advantages are clear, excuse the pun. 1- Invisalign® moves the patient’s teeth without anyone knowing. This is because the aligners are made of clear plastic and are virtually invisible when on the teeth. Even a person talking to you in close proximity can’t see the aligners on your teeth. Contrast this to the glaring metal on display with traditional braces. 2- Invisalign® is comfortable. Metal bands rub on your cheeks and lips. Wires poke your tongue and cheeks. Monthly “adjustments” usually call for some ibuprofen afterwards to deal with the serious aching. If you play an instrument or sports, metal bands can be a serious pain. 3- Keeping your teeth clean with braces is quite difficult. Removing food stuck on the bands and from under wires requires diligence. To floss, you need a threader. With Invisalign®, you simply remove the trays and brush and floss your teeth normally. 4- Braces limit some foods you can eat. No corn on the cob. No really sticky or chewy foods. With Invisalign®, you simply take out the tray and eat! The goal is to wear your Invisalign® aligners for at least 20-22 hours every day. Once they are on your teeth, you’ll forget they are there anyway. You remove them to eat or, say, if you play trumpet in band. And you remove them when cleaning your teeth. Each Invisalign® aligner is designed to exert a certain amount of pressure on certain teeth, pushing the teeth in a certain direction. When this pair of aligners has done its job moving your teeth, the next aligners will exert slightly different pressure to continue moving the teeth toward their final position. To accomplish the movement goals, it’s important to wear your Invisalign® aligners for at least 20-22 hours every day without fail. What is the Invisalign® Process? The first step toward straightening your teeth with Invisalign® is a full dental examination and analysis of your bite using the iTero digital scanning system. This system instantly creates precise 3D digital images of your teeth. Using these, Dr. Sorensen then maps out a precise treatment plan, including the movement of your teeth in stages. Invisalign® software even allows the patient to preview how his or her teeth will change. This information is then sent to Align Technology, which creates the aligners. When your Invisalign® aligners arrive at Blue Water Dental, you will meet with Dr. Sorensen. He will explain how to use the aligners and will give you the first few pairs in the series. From there, every two weeks you will discard the current aligners and switch to the next pair. About every six weeks you’ll see Dr. Sorensen so he can monitor your progress and give you the next sets of aligners. What Alignment Problems Can Invisalign® Treat? How Long Will it Take to Straighten My Teeth with Invisalign®? Average treatment time with Invisalign® is about one year. Less severe alignment issues may take less time. If, at the end of your treatment, Dr. Sorensen and you agree that more movement is needed, then we can order more aligners. Is Invisalign® Appropriate for Teens? Invisalign® is perfect for teens, especially when you consider the delicate self-confidence of the average teen and the trauma that is having a “metal mouth.” Invisalign® has been used with over one million U.S. teenagers and those numbers are growing as more and more adults and teens learn about this revolutionary method for moving your teeth without all the metal. Invisalign® can accomplish mild to moderate tooth movement needs, so it can handle most teenage orthodontic needs. Really aggressive, more severe movement may not be appropriate, but Dr. Sorensen can tell you if your orthodontic needs, or those of your teenager, can be handled with Invisalign®. 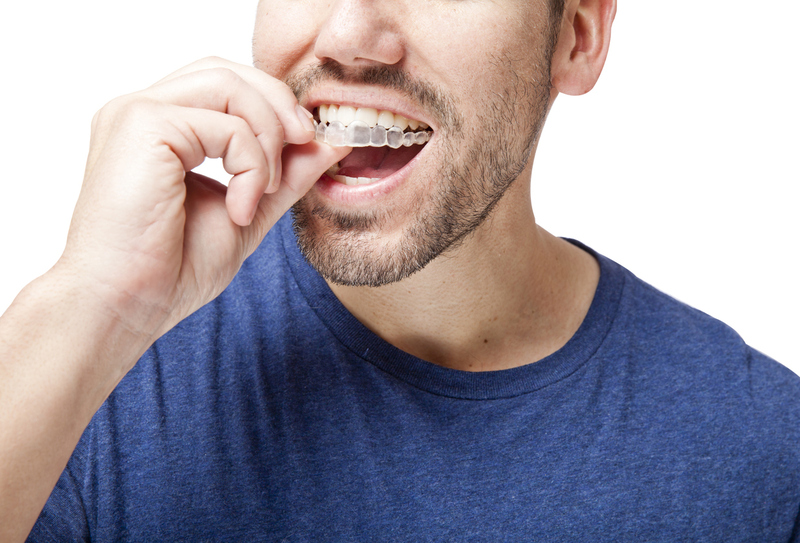 Will Invisalign® Aligners Affect My Speech? You may have heard rumors of an “Invisalign® lisp.” It is true that some patients develop a temporary lisp when wearing their aligner trays. A lisp is a speech defect that causes “s” and “z” sounds to be pronounced as “th.” Lisps are caused by improper tongue placement inside the mouth during speech. This affects airflow and pronunciation. Some patients with Invisalign® (and with traditional braces, by the way) develop lisps because the aligner trays alter the space within their mouth, causing the tongue to move a little differently, and altering some pronunciation. The vast majority of patients simply adjust to the thin plastic trays and the temporary lisp is just that…temporary. 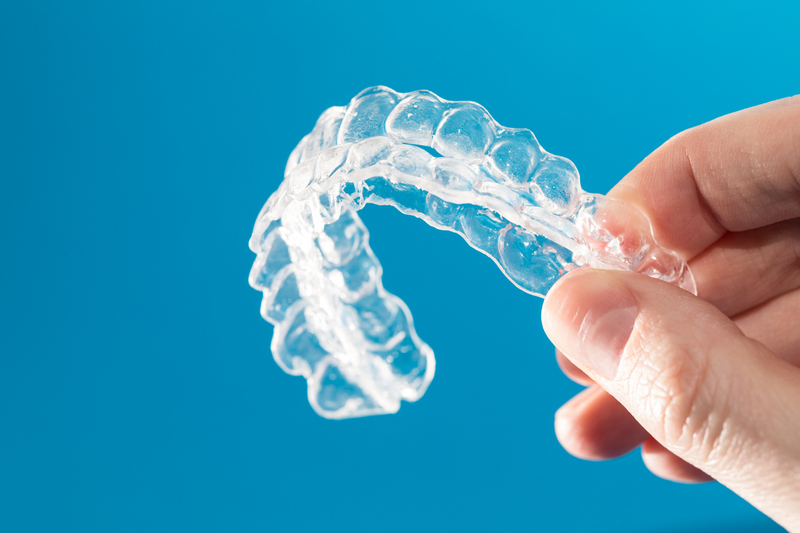 How Do You Keep Invisalign® Aligners Clean? Because you can simply take out your aligners and brush them with your toothbrush, keeping both your teeth and your aligners clean is much easier than with traditional braces. You have some options when caring for your Invisalign® aligners. You can remove them and gently brush them every night with a toothbrush. You can also soak your aligners in denture cleaner, Retainer Brite®, or the official Invisalign® crystals to keep them clean and sanitized. Or, another option is to use clear anti-bacterial soft hand soap to clean your aligners. I’m Currently Wearing Traditional Braces. Can I Switch to Invisalign®? Once some people get traditional braces on their teeth they really regret it. They feel overly self-conscious about the metal bands, and the discomfort of wires poking their cheeks and tongue and the monthly pain of adjustments makes them hate their braces. The good news is that you can switch to Invisalign®, if Invisalign® can accomplish the necessary movement. What you need to do is schedule a consultation with Dr. Sorensen, and he can tell you if you would be a good candidate for Invisalign®. If so, then you’ll need to get your braces removed. Once that is done, Dr. Sorensen can create the 3D image of your teeth and bite and plan your Invisalign® treatment. Most dental insurance covers a part of your Invisalign® cost (which is basically the same cost as traditional braces). This is the same arrangement as for traditional braces. What Happens When My Invisalign® Treatment is Complete? Do I Wear a Retainer? Once your teeth are moved into their new positions, they’ll need to stay there. That’s why traditional braces transition to the use of a retainer. This prevents the teeth from drifting back to their former positions. Invisalign® doesn’t use a retainer with a plastic piece that snaps onto the roof of your mouth. Instead, Vivera® retainers, made from the same material as the Invisalign® aligners, keep the teeth in place. 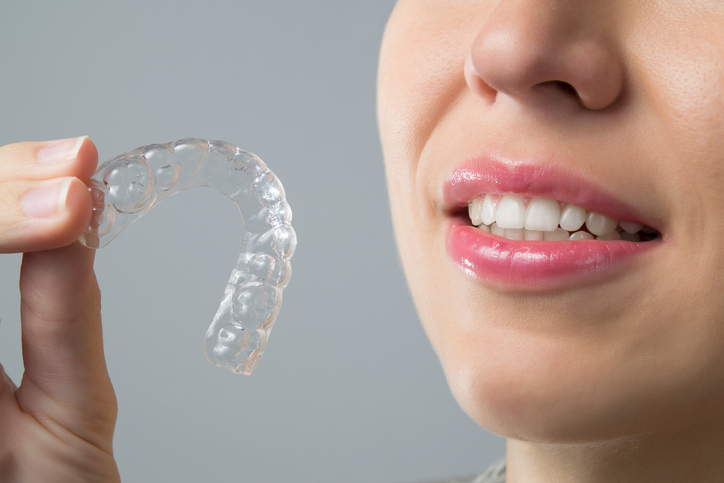 These Vivera® retainers are similar to the aligners, but they are thicker and more durable because they need to be worn for longer than just a couple of weeks. You will receive four Vivera® retainers to be swapped out over the course of your retention period. Dr. Sorensen proudly provides Invisalign® to patients in Ponte Vedra, Palm Valley, Jacksonville, and Nocate, FL and surrounding areas. If you are in need of Invisalign® or other cosmetic dentistry services, contact Blue Water Dental of St. Johns at (904) 395-7771 or Request An Appointment today.